Our economical window gates offer a cost saving visual and physical deterrent allowing business to be safe and secure from smash and grabs and break-ins after business hours. Window gates when opened glide out of the way becoming hardly noticeable during working hours. Two types of window gates are available single and pair gates. Keep your business safe after hours with door & window folding scissor gates. 1. Available in top hung and/or bottom rolling track configurations. 2. Custom-built solutions fit any opening. 3. Manufactured in Heavy-Duty and Extra-Duty galvanized models. 4. Protect a single access point or complete facade. 5. 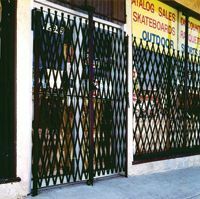 Designed to provide a more stable and secure storefront window security gate. 6. Storefront window Gates pivot 180 Degrees on their mountings. 7. Provides around the clock, 24/7 protection. 8. Extra-Duty models configured with top and bottom track for maximum security. 9. Optional top H bracket for pair gate provides higher security when being used. Our Store-Front Security Gates stand up any type of harsh weather including heat, rain, and snow. Our gates will not be damaged by even harsh industrial chemicals and cleaning agents. All of our store front gates come with a galvanized finish that makes them virtually maintenance free and delivers the best in protection with a lower cost of ownership. Tampa Bay Security Door Gates can be customized to fit any security need. 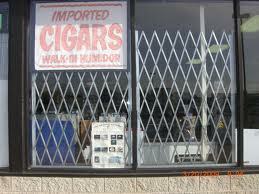 Storefront window gates can protect a single access point or provide a complete front-line wall of security. Please give us a call for a FREE Quote.